Our daughter was born with a very large hemangioma that extended from an ankle to her midsection. Because steriods were the only option at the time, she underwent a year's worth of steroid treatments along with laser treatments to arrest the growth of the hemangioma and to repair the associated skin blistering. It was difficult to watch as she had to endure the pain caused by the hemangioma, but eventually the hemangioma began to involute. We thought the worst was behind us, but Hannah's ordeal was not over. During Hannah's preschool years we began to notice a pattern. On a fairly regular basis we would receive a call from her preschool saying that she vomited and fell into the deep sleep in the office. Fever was not associated with this migraine like behavior pattern. Even at this point we didn't make a connection between this migraine like pattern, the problems with the focusing structures in her eye, and her hemangioma. By the age of five, Hannah had several episodes of this vomiting-sleep pattern. Because she was able to verbalize at this point, she complained of her head hurting above her left eye. Her pediatrician referred us to a local neurologist who had an EEG and brain MRI performed on her. The brain MRI indicated a possible AVM.We were then referred to Vanderbilt medical center where Hannah was diagnosed after an angiogram with arterial dysplasia in two areas of her brain. After sharing Hannah's history up to this point with the neurologists and neurosurgeons at Vanderbilt, Her neurologist suggested that Hannah might have PHACE Syndrome. Her neurologist ordered an echocardiogram and ultrasound on Hannah's heart to rule out cardiovascular issues. Other then a flat aortic arch, everything looked good. 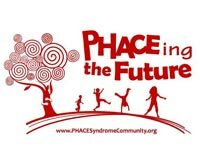 We were given information on PHACE syndrome that eventually led us to Children's Hospital of Wisconsin. In April 2012 we traveled to Wisconsin. Hannah had an MRA/MRI performed and also took part in two PHACE Syndrome genetic studies. Here we learned that Hannah was a stroke risk. Her vasculature would not be able to reroute in order to provide adequate blood flow to areas of her brain. 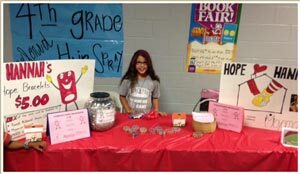 Hannah also began an aspirin regimen at this time and received the diagnosis of staphyloma for her left eye . For the first time, the cause of her hemangioma, staphyloma, and migraine episodes had an explanation....PHACE Syndrome. Summer 2012-After a review of the Wisconsin imaging studies by Vanderbilt neurologists, it was recommended that another angiogram be performed in six months. Dec 2012- Hannah received her second angiogram in December 2012 at Vanderbilt. Her Vanderbilt neurosurgeon suggested there was no change in vasculature and recommended periodic imaging studies. The results of this imaging study was shared with the team in Wisconsin. Feb 2013-The team in Wisconsin recommended that Hannah undergo brain surgery to address the changes they were seeing in her vasculature. While we were trying to decide whether or not to have Hannah undergo surgery, we had another set of imaging studies performed in April 2013. These results, as well as all previous imaging studies, were shared with the team at Boston Children's Hospital where a diagnosis of Moyamoya disease was made. After careful consideration of recommendations made by the teams in Wisconsin, Vanderbilt, and Boston, we made the agonizing decision to schedule Hannah for Moyamoya surgery. Our decision was further validated a month later when we received the results of the genome sequencing and PHACE syndrome study from the previous summer. Hannah's tissue sample revealed she has a gene associated with Moyamoya. Additional testing confirmed this the genome sequencing results. On October 8 2013, Hannah underwent Pial Synangiosis surgery for her Moyamoya at Boston Children's Hospital. The surgery went well and she was walking out of the hospital after five days. Hannah will have to undergo MRIs/Angiograms for the remainder of her life to monitor her cranial blood flow. Her most recent scans revealed very little growth of the transplanted external corotid artery, but other areas of her brain vasculature seemed to be making up for some of the difference. Also, there was no evidence of Moyamoya progression on the other side of her brain. In the meantime, our focus is to make sure Hannah maintains her aspirin regimen, remains constantly hydrated, and that we make those who come in contact with her aware of her condition and the signs to look for in the event of a stroke or TIA. Moyamoya disease is a rare condition (one in about two million get it), and is defined as the progressive narrowing of the arteries to the brain, which causes the vessels in the brain to close off. The result of this can be very painful headaches, transient ischemic attacks (or mini-strokes), as well as regular strokes. The disease, if not diagnosed, can be fatal. The name Moyamoya means “puff of smoke” in Japanese, and is used because of the disease’s resemblance to a puff of smoke on X-rays. It’s something we see every day – children healing because they’re surrounded by their families. 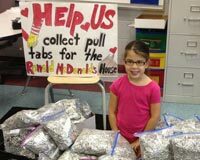 And while RMHC may not be able to make the medicine taste better or erase the pain of a much-needed treatment, we can help lessen the burden for nearly nine million families each and every year. Since 1974, our network of local Chapters have been making children happier and healthier by keeping families together – giving them a place to rest and refresh. A place that feels like home. These programs, tailored to meet the urgent needs of each community, can now be found in more than 62 countries and regions across the globe.